Keep up to date on real estate news, local information and events, tips for buying and selling your home, new listings and more! Redfish Village has gone from having 14 units listed for sale at one point last year to just FIVE today, with prices seeing a slow, steady rise in accordance with the local market. Thanks in part to gulf views, 3rd and 4th floor units have generally sold at a slight premium. We have also recently sold several beautiful 2nd floor units for record setting prices. The complex has become the highly desirable community to live, work, eat and play that it was designed to be, and finally second home/investors are taking notice. Here at RE/MAX Beaches we usually like to let our service speak for itself. 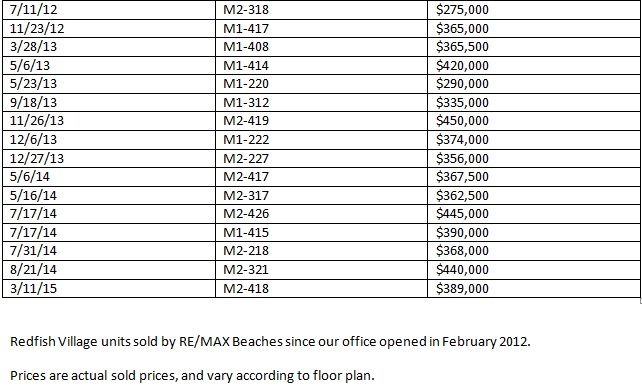 Obviously being on-site at Redfish Village has always given us a tremendous advantage when it comes to listing and selling Redfish units, but in case you needed any further clarification of our status as “Redfish Village Real Estate Experts” take a look at the table below to see all the units we have sold in the past 24 months.